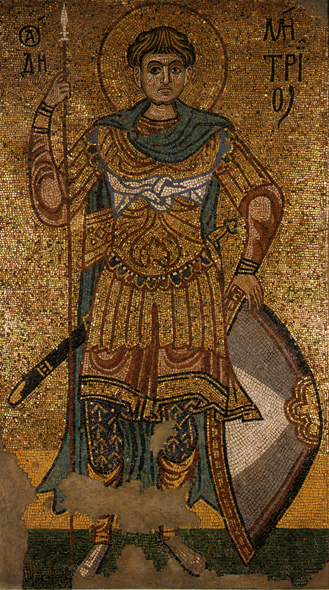 12th-century mosaic of St. Demetrius of Salonica, formerly in the Golden-Roofed Monastery of Kiev, now in the Tretyakov Gallery of Moscow. For other saints with the name "Demetrius," see the disambiguation page. The holy, glorious and right-victorious Great-martyr (Greek: Μεγαλομάρτυς) Demetrius of Thessaloniki the Myrrh-streamer (Greek Μυροβλήτης) (also Demetrios) is one of the most popular saints in the Orthodox world. He was martyred around the year 306 in Thessalonica, and his cult rapidly grew during the Middle Ages, when he was regarded as the first recognized patron and protector of the city, militarily as well as spiritually. His feast day is celebrated on October 26. The Serbian Orthodox Church commemorates the Saint as a Mitar having a feast of Mitrovan on November 8. Demetrius came from a noble family of the Roman province of Macedonia. Through this noble ancestry and through his own ability and virtue he rose to a high military position under Galerius Maximian, Caesar of the Eastern part of the Roman Empire (with Diocletian as the Augustus, or senior emperor). Despite this position in the still-pagan empire, he remained fervent in faith and works for Christ, encouraging many Christians to endure persecution and even bringing many pagans to the faith. When Maximian returned from one of his campaigns to Thessaloniki, which he had made his capital, he had pagan games and sacrifices celebrated for his triumph. Demetrios was denounced by pagans who were envious of his success, and he was thrown into prison. While in prison he was visited by a young Christian named Nestor, who asked him for a blessing to engage in single combat with the giant Lyaios (or Lyaeus), who was posing as the champion of paganism. Demetrios gave his blessing and Nestor, against all odds, slew his opponent in the arena, as David had once defeated Goliath. The enraged emperor, learning that this had occurred with Demetrios's aid, first had Nestor beheaded outside the city and then had Demetrios impaled in prison. Later Demetrios's servant Lupus was beheaded after using his master's blood-stained tunic and signet ring to work many miracles. The Christians buried Demetrius and Nestor next together in the bath where Demetrius had been imprisoned. During the seventh century a miraculous flow of fragrant myrrh was found emanating from his tomb, giving rise to the appellation Mirovlitis, the Myrrh Gusher to his name. His tomb containing his relics is now in the crypt of the Church of St. Demetrios in Thessaloniki. St. Demetrius is revered as the patron saint of Thessaloniki and is believed by the people as having intervened to save the city over the years from invading foreigners, from the Slavic nations, Bulgarians, Arabs, Saracens, and others. While well remembered in the Hellenic world, the memory of the Great Martyr Demetrius of Thessaloniki found an attachment in the Slavic, particularly the Russian, world from the times of the Russian Primary Chronicle. Extreme popularity for Saint Demetrios is first attested in the sixth century. It grew because of his miraculous interventions in defense of the city during the many sieges it endured during the early Middle Ages, particularly by Slavic tribesmen who overran the old provinces of Hellas and Macedonia during the sixth through eighth centuries. His cult was centered around the basilica that bears his name in Thessaloniki, which contained a ciborium which acted as a cenotaph, since his relics had not been found. Later his relics were found and confirmed through their miraculous outpouring of myrrh -- hence the saint's epithet of "Myrrh-streamer." He is depicted in earlier images in civilian aristocratic garb of the late Roman Empire, and in later iconography as a Byzantine soldier. Because of his military protection he is often paired with St. George of Cappadocia, another great military saint. They are usually depicted on horseback, with St. Demetrios spearing a man (perhaps Lyaios, or one of the pagan Slavs whose assaults he warded off from his city), while St. George spears a dragon. The saints are both youthful and unbearded, by can be distinguished by certain characteristics, including hair style and the colors of their garments and horses. Nestor, Demetrios's protégé, is commemorated the day after Demetrios, on October 27. Many scholars today believe that Demetrios was not a soldier but a civil official and that his martyrdom may have actually occurred at Sirmium, an important Roman garrison-town in the northern Balkans. Hieromonk Macarius of Simonopetra, Christopher Hookway (trans.) The Synaxarion: The Lives of the Saints of the Orthodox Church: Volume 1: September, October (Ormylia, Greece: 1999) under the entry for October 26. This page was last edited on August 31, 2017, at 10:36.